The image was taken by a camera aboard the Sojourner rover on Sol 4. 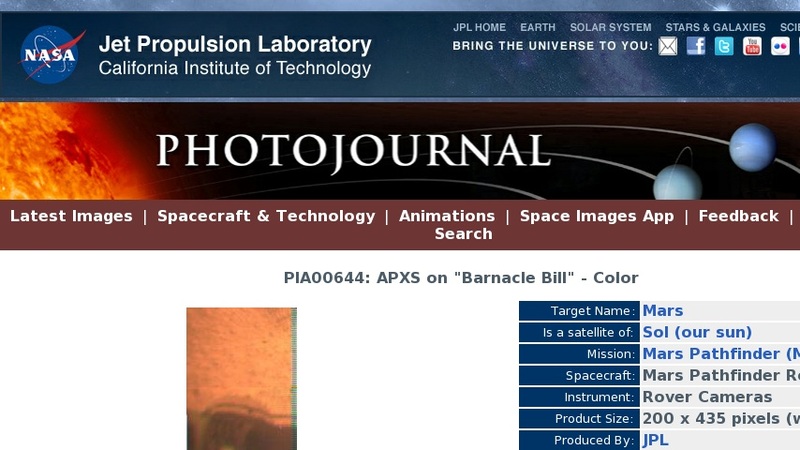 Portions of the rover's Alpha Proton X-Ray Spectrometer (APXS) instrument are visible studying Barnacle Bill. Mars Pathfinder is the second in NASA's Discovery program of low-cost spacecraft with highly focused science goals. The Jet Propulsion Laboratory, Pasadena, CA, developed and manages the Mars Pathfinder mission for NASA's Office of Space Science, Washington, D.C. JPL is an operating division of the California Institute of Technology (Caltech).